A few weeks ago I was lamenting the fact that while I love the setting and style of Shadowrun I dislike the system. To me it is overly complex and while I've attempted several times to learn it I have failed (I own 2nd, 4th and 5th editions). during this lamenting +Frank Turfler brought up the idea of "converting" S&W or LL to Shadowrun. Good idea and one, as the picture shows I took seriously. So in addition to Eldritch Shadows there will be a smaller appendix heading down this route. 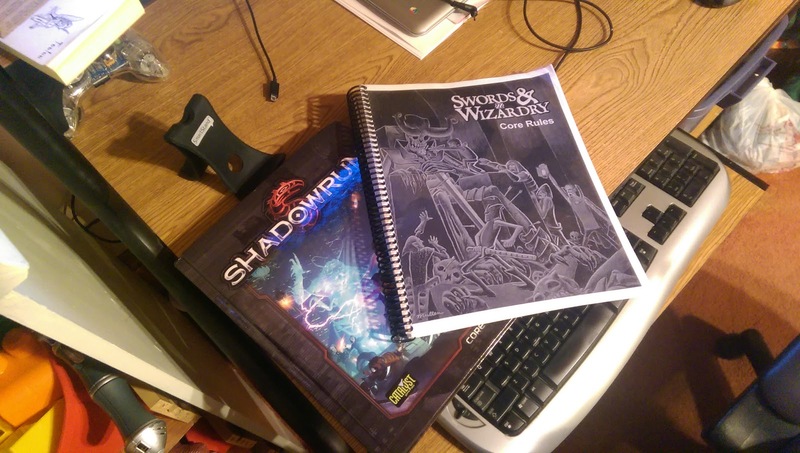 IT is not my intention to ape Shadowrun with this appendix but to distill the style (as in fashion) of the game and implement it into the Eldritch Shadows supplement for Swords & Wizardry. Astral and Net-Diving: Wisdom score as health bracket while traversing Astral Plane, Intelligence for Net-Diving ... how would that work - Net Hacker Tommy losses Intelligence "health" for damage taken within the net ... Affect real Intelligence score? Maybe too complex ... use intelligence as AC while net-diving? Possible. Qualities: Shadowrun has flaws and perks to buy with ingame consequences ... apply? ... no, core of OSR is improv, a player doesn't need a stat or a point to tell her she's a drunk who's really good at coding and dresses like a valley girl from the 1980s ... improv! Classes: Keep the subclasses from ES ... maybe change name? Add new class for hacking ... Net-Diver? Think of something cooler than "hacker". Other: Apply Ability checks and Sanity as in ES? Yes, Sanity can be further applied to bad Astral and Net-Diving runs ... Defense rules as in ES ... Maybe, still trying to figure that out as a whole ... maybe not. Nice one, dude. Keep going! I used to love Shadowrun. Sounds like better game mechanics (S&W) than what SR presents. Keep it OSR!